Civil organizations and churches in the northeast have appealed to the UN Secretary General Kofi Annan to visit the tsunami hit regions in the LTTE controlled areas as he reached Colombo Friday 6.10 PM. Rt.Rev. Dr.Thomas Soundaranayagam, Bishop of Jaffna, Rt.Rev.Dr. J. Kingsley Swampillai, Bishop of Trincomalee-Batticaloa and Rt. Rev. Rayappu Joseph, Bishop of Mannar urged The Secretary General to visit Mullaithivu and meet LTTE leaders and discuss with them about the future rehabilitation of the Tsunami victims. Most of the appeals have highlighted the positive effects of his visit to LTTE controlled areas in promoting peace through negotiations. The Secretary General, upon arrival, was scheduled to meet with President Ms. Chandrika Kumarathunga. He is on a two day visit to Sri Lanka to witness tsunami destruction. "The visit of Secretary General Kofi Annan will contribute a great deal in making the peace talks succeed. This is a long awaited dream of the Tamil people and the whole nation as well." said one appeal. "Needless to say that his visit to Mullaithivu will be an eloquent expression of his commitment to peace in our land through negotiations as it is bound to better the relationship of the parties to the divide." said another appeal. Annan is the first U.N. chief to visit Sri Lanka - since Kurt Waldheim was here in 1975. 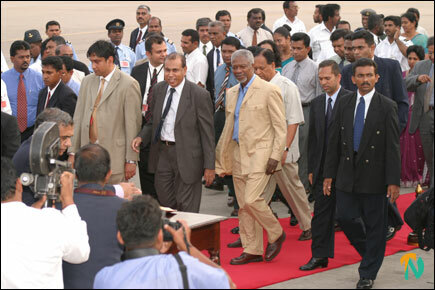 Annan was expected to meet the heads of U.N. agencies in Colombo later Friday. He was accompanied by Mark Maloch Brown, administrator of the U.N. Development Program, and a 17-member UNDP team. "I have come to know about the immediate visit of the UN Secretary General Mr.Koffi Annan to Sri Lanka in order to see the damages to life and properties caused by Tsunami catastrophe. All the coastal cities in the northern province of Jaffna had to bear the brunt of the tidal wave. About six thousand people have perished in this disaster, two thousand are missing and 170,000 people had been rendered homeless. The town of Mullaitivu has been totally devastated and all buildings have been razed to the ground. "Last three days the Vatican Envoy Most Rev.Dr.Mario Zenari was in Jaffna and he visited all those places including Mullaitivu. He was shocked to see the destruction of the villages and expressed his solidarity with the suffering people of Jaffna. "Therefore as Roman Catholic Bishop of Jaffna together with the Bishops of Trincomalee-Batticaloa and Mannar and all the people of Jaffna I am humbly requesting the Secretary General Mr.Koffi Annan to visit the affected parts in the north and meet LTTE leaders and discuss with them about the future rehabilitation of the Tsunami victims. "May I strongly urge you to persuade the UN Secretary General of the importance of visiting the North which has suffered very much due to the ethnic conflict."